Buy your first ticket of the year at full price + 1 €, and come as many times as you like. You will be at the Grotte as at home! Stay connected, others will join us soon! You and your friends receive a 10% discount on the famous Grand Rappel and the Backstage. 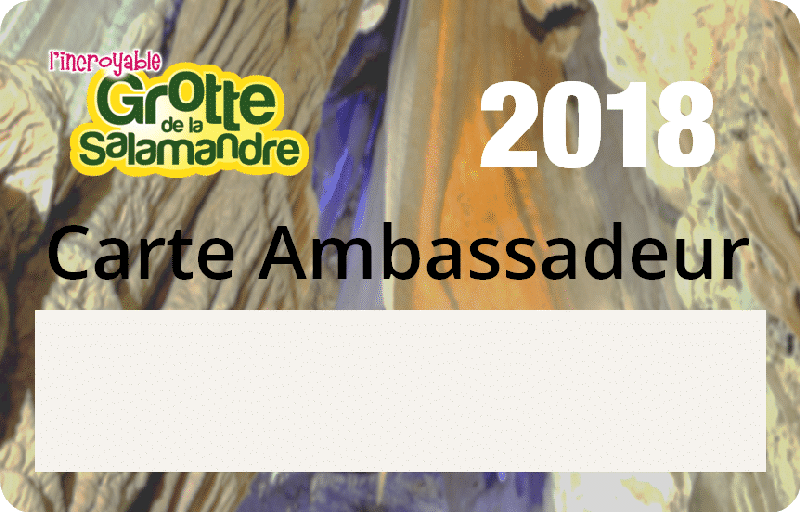 Of course, your title of Ambassador guarantees you to be among the first to know what happens at the Grotte. This way, you will not miss our concerts or flying the Aeroplume. When you purchase a Guided Tour, Belvedere, Backstage or Grand Rappel ticket, all you need to do is ask our host staff to join the Ambassador Program. It will cost you 1 € which will be added to the price of your ticket. In exchange, we will give you a numbered card on which will appear your name. This Card will instantly entitle you to all of the above benefits for the entire season. The Ambassador card is personal and the people to whom you lend it will not enjoy the same benefits as yours. For example, they will receive a discount of 10% on their next visit while for you this next visit will be free. You can download the rules of our Ambassadors Program by clicking here. You can also order your ambassador card by booking your ticket on Internet. We will give it to you when you visit our front desk at the Grotte.